In her ad, Hillary says, “...the deck is still stacked in favor of those at the top.” Her message is vote for me and I'll stop those SOBs from hogging and stealing your share of the American pie. 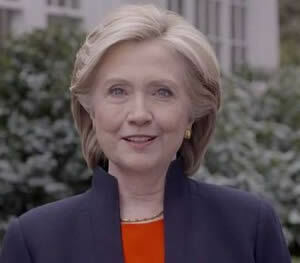 Hillary's ad also mentioned that Americans have gone through challenging economic times and the importance of family. Well, the truth of the matter is the greatest enemy of business and families is the Democratic party. Democrats continuously exhibit hostility towards business, implementing anti-business policies, intrusive and job killing government regulations. Democrats continue to make it easier and even encourage more Americans to forget working for a living and simple rely on government handouts. One can only conclude that this is Democrats' insidious strategy to win new voters. Who is going to bite (vote out of office) the hand feeding them? Folks, we are talkin' over 92 million Americans unemployed, but still have cellphones, flat screen TVs and not missing meals. As for the American family, Democrat policies which enable and even nurture bad behavior contributes to the destruction of families. As an American who happens to be black, I have experienced in my family the devastating effects of Democrats' low expectations of blacks; numerous cousins addicted to government welfare which birthed serial out-of-wedlock births, crime, drug abuse, incarceration and early deaths. Here we go again. Hillary comes out promising to be a champion of the suffering and down trodden which she and her party created.